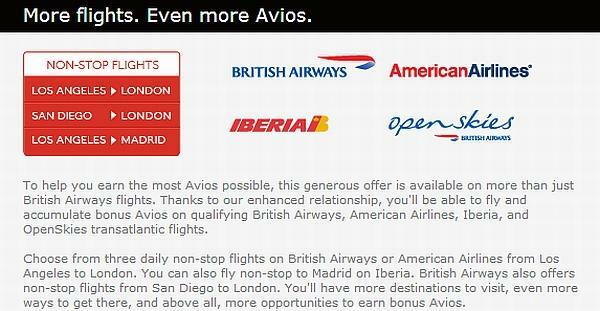 British Airways is offering 25% bonus for converting hotel points to Avios. This offer is valid until January 13. There is no need to register for this offer and you can read more about it here. You can convert points from Starwood, Club Carlson, Marriott, Hyatt, Hilton, Priority Club, and Shangri-La’s programs into Avios. Airlines tend to intermittently run promotions for hotel point conversion to their miles. These offers tend to vary. Would I convert any of my hotel points to Avios due to getting 25% conversion bonus? I absolutely would not, but it doesn’t mean that this promotion could not work for you. This promotion is only open to Eligible Participants. An eligible participant is a person aged 18 or over and is a British Airways Executive Club Member (“BAEC”) (membership terms and conditions apply) and is enrolled and registered with one of the hotel partner loyalty programmes. By taking part in this promotion, Eligible Participants confirm that they accept the Terms and Conditions below. 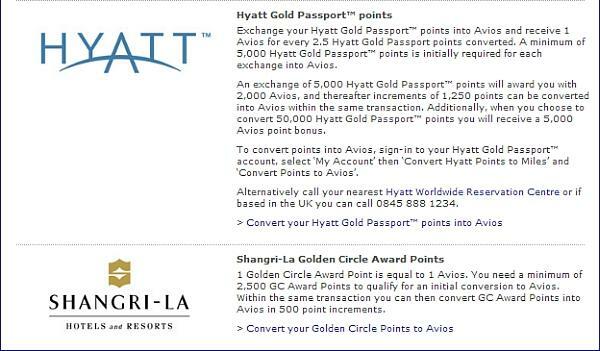 To convert your points, please contact the hotel whose points you wish to convert to Avios. Taxes, fees and charges remain payable by the BAEC member. Bonus Avios can take 4-6 weeks to show on your account from the date of conversion. Once they have been credited, you can start redeeming them for flights, hotels and Avis car hire.· Bonus Avios is non-redeemable for cash and non-reversible. Bonus Avios is issued subject to the BAEC Terms and Conditions http://www.britishairways.com/travel/termcn/public/en_gb and all passengers and baggage are subject to the general terms and conditions of carriage. Reward flights are subject to availability and capacity control and availability may be limited at peak times. Hotel loyalty scheme membership, and earning and redemption of points are subject to the Terms and Conditions of each specific hotel’s loyalty scheme in addition to British Airways Terms and Conditions, as applicable. This promotion cannot be used in conjunction with any other British Airways offers or promotion. Promoter reserves the right to withdraw the promotion or amend these terms and conditions without prior notice at any time, for whatever reason, and without any liability to customers for doing so. This promotion shall be governed by the laws of England & Wales and the exclusive jurisdiction of the English Courts. British Airways has updated the award booking engine on britishairways.com to use the same engine that has been use on IAG’s Avios website. You no longer have to choose the engine to show partner airlines. They are now shown by default. You just have to bear in mind that BA charges awards by every single segment separately (some exceptions apply within Europe) and just combines the segment prices to come up with a total. The one-way is priced at 37500 miles and the “taxes” are $269.16. The miles required is the same as on the BA only flights but the “taxes” are $289. BA wants 60K Avios and $347.35 for this combo. The new award booking engine is better because it shows the partner airline inventory by default. You just have to make sure and check number of different options to find out the lowest price in Avios. As BA charges per segment, it is better to book a direct flight as a result. People who are not living in Oneworld hub cities are basically screwed. British Airways and Iberia launched the Avios a year ago. British Airways Executive Club program went from being relatively good in long haul redemptions to being one for ok’ish awards in short-haul. The price of the long haul awards with multiple segments went through the roof. Now, British Airways is giving a 25% discount on the number of Avios needed for award trips in all cabins for trips originating in London until May 31, 2013. You need to make the award booking by 20th of November. Note that zones 1 to 3 are not included in this offer. This discount also applies for points + money options & 2 for 1 vouchers that certain credit card holders get. I tried to do few searches for places like Cape Town, but couldn’t find any availability for first class seats. Then, I decided to check Mauritius, where BA flies from London Gatwick (leisure route obviously). I was able to find some availability in BA’s Club World business class cabin. You can see the message that the award has been discounted. You just click the link and you will see a pop up with the price breakdown in Avios and the discount. You can click other link to get the cash price breakdown. As these awards are all originating from London, you are required to pay the APD (Air Passenger Duty) that is high on premium cabins. More than 60% of the taxes/fees is the BA’s fuel surcharge. Personally, I have given up of trying to use Avios for long haul trips in premium cabins due to very high price in Avios combined with the (often) ridiculous fuel surcharge component. Avios can be quite valuable for short haul non-stop flights between expensive city pairs. If you have access to those 2-4-1 vouchers, these Avios redemptions in premium cabins make more sense and even more now during the extra 25% discount. British Airways just sent out an email about the new partnership with Fairmont, Raffles & Swissotel that had already started on October 1. This offer is valid for stays until December 31, 2012. There is no need to register for this offer, but you can find more information about this offer here. To celebrate the launch of the new partnership, these hotels are offering 500 bonus Avios for each of the first three nights in top of the usual 500 Avios per stay. You can earn maximum of 2000 Avios per stay. Fairmont President Club Premier members will receive an additional 250 Avios and Platinum members an additional 500 Avios per stay. To receive airline miles, reservations must be booked on qualifying rates: Corporate, Package and Sell Rate of the Day rates and excludes some discounted packages. It is always nice to see Fairmont, Raffles, and Swissotel to have more airline partners. Just be prepared to follow up in a case that the miles don’t automatically show up on your British Airways Executive Club Account. Le Club Accorhotels has a bonus offer for British Airways Executive Club members. For a stay of 2 days or longer, you can earn 2000 bonus Avios. You can access this offer here . This offer is valid for stays between October 1 and January 31, 2013, for stays that are booked between October 1 and December 31, 2012. You need to activate the automatic point deposits to Avios to be eligible for this offer. Note that all the existing points sitting in your account are likely to be converted and moved to Avios as well. Ensure your automatic conversion is set up prior to making your booking, otherwise your bonus Avios will not be credited. 4. Then simply select ‘Executive club’ on the drop down and complete the necessary fields. This is a good offer if you have an Accor hotel stay of two nights or longer coming up before January 31, 2013. Note that you need to do the actual booking by December 31, 2012. 1.This offer is valid for bookings made between 1st October – 31st December 2012 and 1st October and 31st January 2013. 2. This offer entitles British Airways Executive Club Members enrolled in the Le Club Accorhotels program (regardless of their status), to benefit from earning 2,000 bonus Avios when the Member has selected British Airways as their preferred automatic conversion option. 3. 2,000 bonus Avios will be earned if the Member stays 2 or more nights between the dates stated above. 4. Bonus points are only awarded on the first stay. Multiple stays will be counted as one. The 2 nights need to be consecutive. 5. A minimum of two nights must be booked. 6. You must book your stay online at accorhotels.com, participating brand websites, or via the Call Center to benefit from this offer. 7. General Le Club Accorhotels conditions apply. It has been a busy week with IAG, the parent of British Airways and Iberia, that made an offer to buy the rest of the Vueling, a Barcelona based discount carrier, that it doesn’t already own and an announcement of layoffs of around 4500 at its Iberia unit. IAG made a bid to buy rest of the Vueling that it doesn’t already own on November 8. Currently IAG owns about 46 of the airline. Unlike IAG’s Iberia, Vueling is a profitable airline and has considerable amount of cash on its balance sheet (407 million euros). Then on Friday, the IAG announced that it would need to fire 4500 employees of the Iberia unit that is currently not profitable. The airline has tried to move more of Iberia’s flying to its low cost Iberia Express unit. That has resulted the mainline to have too many employees working for it. The overall economic problems of Spain has resulted in fewer flights than previously required. Many of the European airlines are trying to outsource their unprofitable European flying that is required to support the network. Lufthansa recently announced to move all of the flying that doesn’t touch its Munich and Frankfurt hubs to Germanwings. Finnair has already moved all of its Embraer fleet to be flown by UK based Flybe under their Flybe Finland subsidiary, although under Finnair flight numbers and service concept. It is interesting to see if IAG’s bid for Vueling is successful and whether they would incorporate the airline under the Iberia Express brand. The problems with Iberia that requires fewer headcount has been widely known due to fewer flights having been flown under the mainline Iberia-brand. Reducing headcount is not easy in Spain and especially now that the country is going through rather tough times. Hilton HHonors is running number of airline related offers for double and triple miles during the months of November & December. None of these promotions are listed on Hilton’s own website, but rather were targeted for frequent flier members of participating airlines. If I have missed any Hilton (or any other hotel or airline related promo), you can always just send me an email to john@loyaltylobby.com. Just forward the promo email that you received from the program. These are normally called airline acquisition promotions. Frequent fliers tend to stay quite a few nights hotels as well and they are thus very important group for hotel programs to attract. Note that you need to change your Hilton earnings preference to Points + Fixed Miles or Points + Variable Miles. The preferable option is dependent of the airlines program, hotel brand you are staying at, and the folio amount. My personal favorite that I have already maxed out is the Hilton’s promotion with Virgin Atlantic. I won’t have that many stays with Hilton this quarter. Five stays earns 15K bonus + 5K base Virgin miles. I will transfer these back to Hilton for 40K Hilton HHonors points. You can get bonus miles or points for American Airlines, JetBlue, United, US Airways or Virgin America for stays at Waldorf Astoria hotels. The bonus is based on nights and expire on December 31, 2012. Conrad hotels are offering 1000 bonus miles per night for American Airways, United Airlines, and US Airways frequent fliers. Offer is valid until December 31, 2012. You can earn 250 Delta MQM’s and double SkyMiles for stays of 2 nights or longer between October 1 and December 15, 2012. This offer is available at select hotels. 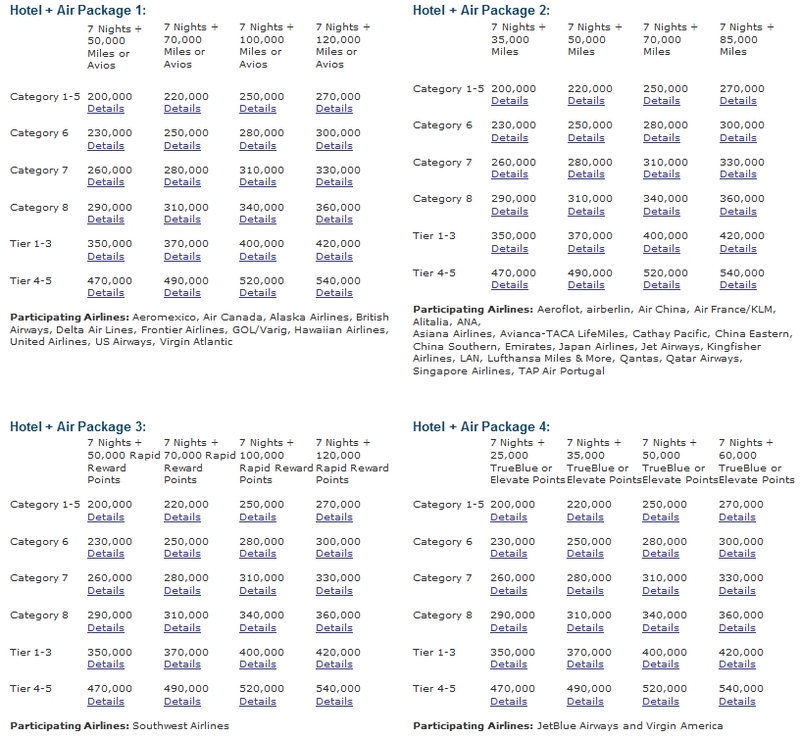 Hilton is offering double airline miles for American, Aeromexico, AviancaTaca, MultiPlus(TAM) and United on select hotels in Latin America until December 31, 2012. Hilton has a promotion with Miles & More (Lufthansa, Swiss, Austrian etc) for up to quadruple miles until December 31, 2012. You can earn 4000 bonus Emirates Skywards miles on your second stay. This offer is valid until December 31, 2012. Hilton is offering double points for Air Canada Aeroplan members until the end of December, 2012. Double Qantas points (2000) for Hilton stays between November 1 and December 31, 2012. Hilton is offering triple miles for number of Asian airlines frequent flier members. They have variation of the offer for Thai, Singapore, Korean, Asiana, Malaysia, and Cathay Pacific. You can earn up to 3000 bonus Avios (for BA Gold member) for a Hilton stay by December 31, 2013. Make sure that you have chosen the correct double dip option (fixed vs variable) and have the airline as your preferred double dip airline partner. Some airlines don’t participate to both fixed and variable miles. Also, Hampton Inn and Homewood Suites don’t always earn fixed miles at the full level. Home2 Suites brand earns even less. You have to check these by the airline. I have already done the Virgin Atlantic and British Airways versions of these airline promotions. I am not planning to have more Hilton stays this quarter. You can earn onetime bonus Avios of up to 3000 points by registering for this offer by November 30, 2012, and staying at Hilton family hotel by December 31, 2013. You need to have your Hilton HHonors profile set to Points & Miles and have British Airways as your double dip partner. If you folio amount is less than $500, you should choose Fixed miles. Otherwise, you should go for variable miles (1 Avios per 1 USD). This is a nice onetime bonus for a Hilton family of hotels stay that you can earn. I am a Gold member and it is a no brainer to have British Airways as a onetime double dip partner and earn 500 base points and 3000 bonus Avios. 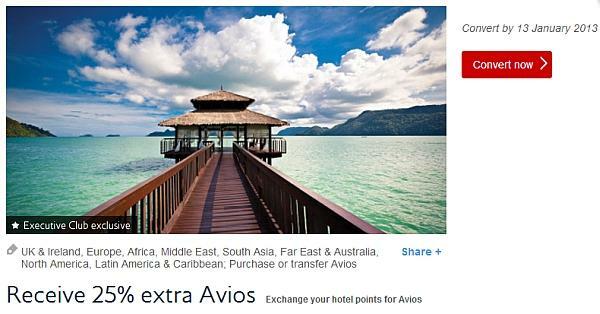 Bonus Avios offer is valid for eligible stays completed after registration, at participating hotels between 19th October 2012 and 31st December 2013. Only stays booked after registration will be eligible for bonus Avios. HHonors members choosing Fixed miles award will earn 500 base Avios per stay and the appropriate bonus Avios based on their Executive Tier status at the time of the first stay. HHonors members choosing Variable miles award will earn one Avios per USD spent and the appropriate bonus Avios based on their Executive Tier status at the time of the first stay. Blue members will receive 1,000 Bonus Avios, Bronze members 1,500 Bonus Avios, Silver members 2,000 Bonus Avios and Gold members will receive 3,000 Bonus Avios. Customers must be an HHonors member to earn bonus Avios. Hilton HHonors members must have their earning preference set to ‘Points & Miles’ and must have ‘British Airways’ as the preferred airline partner. Avios accrued and awards issued are subject to British Airways Executive Club Terms and Conditions. Members must allow 4-6 weeks for the Bonus Avios to reach their accounts. Hilton HHonors membership, earning of Points & Miles, and redemption of points are subject to HHonors Terms and Conditions. Iberia has now also announced their transatlantic bonus offer for fall/winter 2012. The promotion is valid until January 31, 2012, and is valid for Iberia Plus members in the United States and Canada. Registration is required. There are similar offers from United, Delta, American Airlines & British Airways. This offer is valid for direct flights between United States or Canada and Europe that are both marketed and operated by American Airlines, British Airways or Iberia. The offer is valid for all first and business class fares but only for full fare economy. Unlike some other offers, Iberia’s doesn’t require a round trip purchase but is rather based on number of flights that you take. After you have flown more than 4 segments, the bonus for every additional two flights is 50K Avios. There are not offers from oneworld (British Airways, American Airlines and Iberia), Star Alliance (United), and SkyTeam (Delta) for transatlantic travel this fall/winter. The bonus amounts and travel periods are identical. United and Delta offers are only for direct flights from United States to London Heathrow where oneworld offers are valid for all direct flights from United States and Canada to Europe that are marketed and operated by on BA (OpenSKies also qualifies for BA’s version of this offer), AA, and IB. Offer valid on direct flights operated and marketed by Iberia, British Airways, and American Airlines between the United States or Canada and Europe. The cabins and booking classes that are valid for Iberia are: Business Class (J,C,D,R,I), and Economy Class (Y, B, H); for British Airways: First Class (F, A,), Club World (J, C, D, R, I), World Traveler Plus (W, E,T) and Economy Class (Y,B,H); for American Airlines: First Class (F, A), Business Class (J, D, R, I) and Economy Class (Y), to book and fly from 25th September to 31st January 2013. These Avios will be accumulated and noted on your February 2013 account statement once the promotional period has finished. This promotion is not transferable and exclusive to Iberia Plus members in the United States and Canada. It is essential that you register in order to benefit from it. The promotion cannot be combined with any other offers valid during this period. Errors and/or omissions will be rendered invalid. There has been lot of noise in the past two weeks about the press conference that was going to take place in New York today. The CEO of Qatar Airways denied that the airline would have been joining the alliance last week contradictory what was published on Financial Times. The airline is indeed joining the Oneworld alliance and completion of becoming a member is expected to take from 12 to 18 months. So, we are looking late 2013 or early 2014 as likely official joining date for Qatar. You can access the official Oneworld press release here. Currently the oneworld alliance consists of eleven member airlines; airberlin, American Airlines, British Airways, Cathay Pacific, Finnair, Iberia, Japan Airlines, LAN, Qantas, Royal Jordanian and S7 Airlines. Malaysian Airlines and SriLankan Airlines are currently in the process of joining the alliance. Oneworld alliance member Malev went bankrupt earlier this year and the joining of Kingfisher Airlines was cancelled due to its financial difficulties. Qatar is the first of the big three of the Middle Eastern carriers to join an alliance. Emirates has always said that they are not interested in joining and they just formed a partnership with oneworld member airline Qantas. Etihad announced earlier today the deep codesharing agreement that they are going forward with Air France-KLM. It is interesting that Qatar chose Oneworld. It has had more frequent flier ties with Star Alliance carriers like United, US Airways, and BMI than with oneworld ones (none). The airline already serves 120 destinations worldwide. The latest one was reintroduction of flights to Yangon, the capitol of Myanmar, last week. The airline flies to New York, Washington DC, Chicago (in 2013), Houston, Montreal and to Sao Paulo with a continuing service to Buenos Aires. The airline serves more than 30 destinations on continental Europe. The airline has an extensive network in Northern Africa and in the Middle East. The airline serves nine destinations in Central and Southern Africa + Seychelles. The airline servers number of destinations in India and Asia. This is interesting movie from Qatar’s part. We’ll see if Star Alliance is able to lure either Emirates or Etihad. For the most part, I have liked the service that I have received on Qatar flights. I am not huge fan of the transfer experience in Doha, but it should get better in 2013 when the new airport is ready. There are quite a few offers for transatlantic travel this fall and winter. This offer from British Airways is valid for travel between October 1 and January 31, 2012. The offer is valid for flights marketed and operated by British Airways, Iberia, American Airlines, and OpenSkies. This offer is valid for Executive Club members in the United States and Canada. The only drawback is the fare class eligibility. The bonus is eligible for first, business, premium economy, and full fare economy fares. You will earn 15K bonus Avios for first round trip, 35K bonus Avios for the second one, and 50K for the third and subsequent round trips during the promotional period. Note that the travel must start in the United States or Canada and you need to register for this offer before travel. There are quite a few promotions going on for the transatlantic travel this fall/winter that are only eligible for full fare travel. Avios bonus for US and Canadian Executive Club members on qualifying, round-trip transatlantic flights operated and marketed by British Airways, American Airlines, Iberia or OpenSkies booked in flexible/non-restricted Economy or higher fares for travel completed by January 31, 2013. Pre-travel registration required. 1. To be eligible for this promotion, British Airways Executive Club members at least 18 years of age who are locally enrolled and residing in the United States or Canada must (i) register for the promotion between September 27, 2012 and January 31, 2013, inclusive, at ba.com; if you are not a current member, you must enroll in Executive Club and register; and (ii) after registering sufficiently in advance of outbound travel, book and then complete qualifying flights by January 31, 2013. British Airways (“BA”) reserves the right to verify the eligibility of members. By taking part in this promotion, members confirm that they accept the terms and conditions of the offer. 2. Existing bookings made prior to the promotional period do not qualify and this offer cannot be applied retroactively. (iv) on OpenSkies operated flights, includes fares booked in Biz Bed/Business, Prem Plus/Premium Economy and flexible/non-restricted Eco/Economy: J, C, D, R, I, W, E, T, Y, B or H.
This promotion does not apply to flights marketed or operated by franchises, including Comair, Iberia Express, and Sun-Air, or any other code share partners or oneworld© Alliance members. 6. Members must quote their Executive Club membership number when booking their qualifying flights and again at check-in for each flight flown during the promotional period. 7. The following are not qualifying flights and this promotion cannot be used in conjunction with any offer, promotion, or deal, including, but not limited to: (i) redemption bookings; (ii) travel agent or airline industry discounted fares, Consolidator or Wholesale fares, group discount fares, child/infant fares or senior citizen fares, whether or not booked in one of the qualifying booking classes; (iii) bookings made with vouchers or coupons (e.g. shareholder’s discount coupon); or (iv) tickets upgraded from any class. 8. Qualifying flights are subject to availability and capacity control in the booking classes eligible for this promotion at the time of booking. BA does not accept any responsibility in the event that members are unable to book qualifying flights. 9. Please allow 4 to 6 weeks for bonus Avios to be credited to your Executive Club account. 10. British Airways is not liable for the reproduction of this offer or indirect access via third party websites of these terms and where such reproduction misstates or omits any of the information or terms and conditions connected with this promotion. 11. Member must pay all applicable taxes, fees, and carrier charges. 12. BA reserves the right to cancel or amend the terms and conditions of this offer, without notice, at any time. 13. Subject to the full terms and conditions of the Executive Club Programme. 14. Cannot be combined with any other offer. 15. Other significant restrictions apply. There has been a lot of disappointment about Hilton not running a point related promotion this month. They do, however, have four airline related ones going on this month and continuing all the way up to December. The next chainwide promotion “1,000 Reasons” starts on November 1, 2012. If you are NOT interested about airline miles at all, you should take advantage of the promotion that Hilton has with Virgin Atlantic. Five stays would earn you total of 20K Virgin Atlantic Flying Club miles that you can transfer back to 40K Hilton HHonors points. You can continue earning BMI Diamond Club miles until October 27, 2012. You warn 1000 miles per stay regardless of the Hilton brand and for up to 3 days. You can transfer BMI Miles to British Airways Executive Club. BMI Diamond Club will close on December 31, 2012. You can earn 250 Delta MQM’s and double SkyMiles for stays of 2 nights or longer between October 1 and December 15, 2012. This offer is available only at select hotels. If you are to do five stays during the promotional period, I would take advantage of the promotion with Virgin Atlantic and transfer the points back to Hilton HHonors once they have posted. The promotions with Emirates and Miles & More are good, if you are member of those programs and collect their miles. The Delta promotion is not really worthwhile unless you are in need of some MQM’s (Medallion Qualifying Miles). For multiple night stays, you should consider crediting the stays to BMI Diamond Club until 27th of October. You will earn 1000 miles per night for up to 4 nights. Marriott Travel Packages are the best way to use Marriott Rewards points IF you need some airlines miles as well. These packages consists of 7 nights stay at a chosen category or tier (Ritz-Carlton & Marriott Vacation Club) hotel and set number of miles at various airline programs. You will also get a 25% coupon for Hertz rental that I have never been able to use as rates that are not discount eligible have always been a better deal. The reason why these are such a good deal is that you will get a nice chunk of airline miles in the process. You can collect airline miles on your Marriott stays but it is far better just continue crediting towards Marriott points and take advantage of MegaBonuses. Then, when you have enough points in your account to redeem for a Marriott Travel Package, you just issue one. You can essentially “transfer” Marriott Rewards points at 1 to 1 level for airlines like United, US Airways, and British Airways. If we assume that you would use the 7 nights at category 5 property, it would cost you 25K per night but you would get the 4th night free. The number of points required would be 150K. The travel package at category 1 to 5 costs you 270K Marriott Rewards points. If we deduct the point value of the room part (150k), you “transfer” the 120K Marriott Rewards points to 120K airline miles. Each of the travel packages has four level for number of airline miles you would earn by redeeming a travel package. I would suggest that you go for the highest level if possible. If you redeem for a category 1 to 5 package and would later want to stay at the category 6 property, you can do this by paying the difference in points that is 30K. You need to call Marriott Rewards customer service and they can do it instantly. I always suggest that you should issue the travel package at the lowest category first if you are not sure how you are going to use it. You can always upgrade it. But if you issued the package at the higher level that is required for your stay, you can always call the Marriott Rewards customer service and request them to downgrade it and get the difference in points deposited to your account. The hotel certificate that is deposited to your Marriott Rewards account is valid for 12 months after issuance. I have personally, however, been able to extend these more than twice. You need to contact the Marriott Rewards customer service to achieve this. I cannot guarantee that it will work for you, but it has for me. Try extending the award certificate. I have managed to do this few times. If they are not willing to do it, consider giving it away as the number of points you get back is not a lot. If you issued it higher than the lowest category level, downgrade it to the lowest level and get some points back to your account. If you are not able to use it or give it away, you will get some points back for unused certificate and it is dependent and what mileage level you originally issued it. Some airlines like US Airways and American Airlines, which used to be a Marriott partner, tend to run promotions once in a while for transfer from hotel programs. They might give you a 35% to 50% bonus for miles transferred in. This is the time to redeem. I redeemed 3 or 4 travel packages when the partnership with American Airlines was ending and AA was offering bonus for points transfers. I made my first Million Miles status with AA with the help of Marriott. – If there is a day in between that is not available for points, you can pay for it in cash. You need to arrange this with the Marriott Rewards customer service i.e. you stay at the hotel for 10 nights and use travel package for nights 1 to 3 and 7 to 10. You can pay for nights 4 to 6. This package is reserved entire for Southwest. You will receive 50K, 70K, 100K, or 120K Rapid Reward points that are COMPASSION PASS QUALIFYING. If you redeem the highest package and deposit the points to Southwest, you receive a Southwest Companion Pass for a year. This package is for JetBlue TruBlue and Virgin America Elevate members. You will receive 25K, 35K, 50K, or 60K points. IMHO this IS really the best way to use Marriott points IF you prefer getting a lot airline miles along the way. There are some drawbacks to this as well that I listed above and workarounds like extending the certificate for a year. Contact the airline you will use as your carrier. (You must be a member of their frequent flyer program.) Inquire about the number of miles needed to travel from departure location to your destination and remember to take into account the number of people traveling in your party. 1-800-MARRIOTT to make your hotel reservation. Make sure to inform the reservation agent that you are using a Travel Package Reward. After your reservation is confirmed, you can complete the reward order over the phone or order online. Hotel certificate will be issued electronically and will be available at the hotel upon check-in. Airline miles will automatically be sent to your frequent flyer account.Please allow approximately 6 weeks for your miles to be posted to your frequent flyer account or contact your local Marriott Rewards office to inquire about express service (may include a fee). Miles will automatically transfer into the frequent flyer mileage account that matches the name on your Marriott Rewards account. Once processed, airline miles cannot be transferred back to your Marriott Rewards account. Marriott Rewards office to inquire about express service (may include a fee). Now, it has finally come – an email from BMI’s Diamond Club about the closure of the program. If your BMI Diamond Club account is not based in the UK or South West Pacific (Australia/New Zealand), your account will close on December 31st, 2012. You can find more information about this on BA’s website. The log in to the Diamond Club account will move to www.diamondclub.org or non UK/South West Pacific members. All members, however, will not be able to earn or burn Diamond Club miles from September 27th onwards except UK members with BMI branded credit cards. If you are currently holding an award reservation made using BMI Diamond Club miles and you cancel it after December 31st, you will NOT receive any miles back as non-UK/South West Pacific Member. You will, however, receive back taxes/fees that you paid. If you have BMI Diamond Club account and some miles in it, you should just go ahead and link it to British Airways Executive Club account and do the miles transfer. There is really no point keeping miles on BMI Diamond Club account after all earning and burning options have been closed. But British Airways could have just easily opened an Executive Club account and transferred all the remaining Diamond Club points there for members that haven’t done it by themselves. By not doing so, British Airways is able to clear their books from liability that these existing miles represent. With the closure of www.flybmi.com on 28 October 2012, there are some important changes to the Diamond Club. From 28 October 2012, UK Diamond Club members will no longer be able to earn destinations miles, other than through a bmi Credit Card account from MBNA. You can continue to log into your account through our new website, www.diamondclub.org, which will be available from 27 October 2012. In order to redeem destinations miles you can transfer them 1:1 to Avios with the Executive Club. After you have transferred your miles you can spend your Avios on flights, upgrades, hotels and car hire. See ‘Transferring your destinations miles’ below. We are currently reviewing the options for our Diamond Club members who live in the South West Pacific. From 28 October 2012 you will no longer be able to earn or redeem destinations miles and your account and destinations miles balance will be frozen until further notice. You will be able to log into your account to check your balance and update your details through our new website, www.diamondclub.org, which will be available from 27 October. From 28 October 2012, you will no longer be able to earn or redeem destinations miles. In order to redeem destinations miles you can transfer them 1:1 to Avios with the Executive Club. After you have transferred your miles you can spend your Avios on flights, upgrades, hotels and car hire. See ‘Transferring your destinations miles’ below. Take a look at our Frequently Asked Questions for more information about the changes and what they mean for you. You can transfer as many destinations miles to Executive Club Avios points as you like at the rate of 1:1. Simply log in to your Executive Club account and go to the ‘Manage My Account’ page. Here you’ll find a link to the transfer destinations miles tool under the ‘Your Options’ section. Before you start a transfer please ensure that your contact details, including your name, email address and date of birth are up to date in both your Diamond Club and Executive Club accounts. Transfers can be made between individual accounts, but unfortunately transfers into Household Account balances are not possible. After 31 December 2012 this transfer facility will not be available for members outside UK. If you are a Diamond Club Gold or Silver member, you can apply for matching tier status within the Executive Club. 31 December 2012 for all members. Not currently a member of the Executive Club? In order to tier match from your current Diamond Club status to a new Executive Club account, you will need to join the Executive Club via our dedicated enrolment page. Once you have enrolled in the Executive Club as a Blue member please complete the online tier match form. There is no need to complete the tier match form. Already a member of the Executive Club? If your Diamond Club status entitles you to a higher status than you currently have with the Executive Club, you will need to complete a tier matching form. For full information on the changes and what this means for you please see the questions and answers below. As a UK-based Diamond Club member, how can I check my destinations miles balance after 27 October 2012? As a non-UK or South West Pacific based Diamond Club member, how can I check my destinations miles balance after 27 October 2012? As a non-UK/SWP based Diamond Club member you will be able to log into your Diamond Club account and check your mileage balance online at www.diamondclub.org, which will be available from 27 October onwards. As a non-UK or South West Pacific based Diamond Club member, what will happen to my account and destinations/status miles after 31 December? As a non-UK based Diamond Club member your Diamond Club account will close on 31 December 2012. Any destinations or status miles remaining in your account on this date will automatically expire. Remember to transfer your destinations miles to Avios and request your tier match via the online tier match form. To request the transfer you must log into your Executive Club account, select ‘update my details’ from the left hand navigation menu and then select ‘Combine my Avios’ from the list of options on your screen. As a South West Pacific member (i.e. Australia/New Zealand), what will happen to my account? We are currently reviewing options for our customers who live in the South West Pacific. We will freeze your Diamond Club account and destinations miles balance until further notice but assure our members in the South West Pacific that your loyalty is important to us and we will do everything we can to complete this review quickly. What if I have a query as a South West Pacific member? We have created a new website at www.diamondclub.org which will be available from 27 October 2012. Queries can be submitted using the online ‘Contact Us’ section or by contacting the Diamond Club call centre. As a Diamond Club member, which British Airways lounges can I access using my Diamond Club membership card before 31 December? Gold Diamond Club members can access the Galleries First lounge, Galleries Club lounge and Arrivals lounge at London Heathrow Terminal 5. Gold Diamond Club members can also access the London Gatwick British Airways First and Club lounges as well as the London Gatwick Sofitel arrivals lounge. Please note that Gold members may take one guest into the lounge, but guests are not permitted in the arrivals lounges. Silver Diamond Club members can access the Galleries Club lounge at London Heathrow Terminal 5 and the British Airways Club lounge at London Gatwick. Silver members may take one guest into the lounge. Please bring your membership card with you as you may be asked to present this in order to gain access to the lounge. What if I currently hold lifetime Gold status at the Diamond Club? British Airways does not offer an unlimited or lifetime tier status. Diamond Club Lifetime Gold customers will therefore be invited to join the Executive Club Gold tier for a minimum of one year. Are you closing Diamond Club? The Diamond Club is moving to a UK only programme on 31 December 2012. This means that the Diamond Club programme outside of the UK and South West Pacific will close on this date. As a UK based Diamond Club member you can continue to collect destinations miles with a bmi Credit Card from MBNA. We will be in touch with members in South West Pacific in due course to advise the options available to them. Will my future award booking with a Star Alliance airline, Virgin Atlantic, Qatar, Jet Airways, Transaero, BA, bmi baby/regional be honoured? Any existing bookings you have with any Star Alliance airlines, Virgin Atlantic, Qatar, Jet Airways, Transaero, British Airways or with bmi regional will be honoured and you can travel as planned. Due to the fact that bmi is no longer a member of the Star Alliance, and Virgin Atlantic is no longer a partner of the Diamond Club, you will not earn any destinations or status miles on any future bookings with these airlines. You can continue to collect destinations or status miles when you fly with bmi regional until 30 September 2012. You can continue to collect destinations miles when you fly with Qatar, Jet Airways, Transaero and British Airways until 27 October 2012. Bmi baby ceased operation on 9 September 2012. Can I cancel or amend my future award booking with a Star Alliance airline, Virgin Atlantic, Qatar, Jet Airways, Transaero, BA or bmi regional? Unfortunately you will be unable to amend any existing bookings you have with any Star Alliance airlines or with Virgin Atlantic. You can continue to amend any existing bookings you have with bmi Regional until 30 September, or with Qatar, Jet Airways, Transaero and British Airways until 27 October after which you will be unable to make any amendments to your booking. You can choose to cancel any future award bookings you have with any previous or existing bmi air partners at any time. How can I cancel a future award booking with any Star Alliance airline, Virgin Atlantic, Qatar, Jet Airways, Transaero, BA or bmi Regional? You can contact the bmi call centre in order to cancel any existing booking you have. As a non-UK based Diamond Club member with a future award booking – what is the refund policy if I want to cancel my booking after 27 October? As a Diamond Club member based outside of the UK, if you choose to cancel an existing award booking after 27 October 2012 you will receive a full refund of any cash and destinations miles paid when the booking was made. Please note that you must transfer any destinations miles to your Executive Club account before 31 December 2012 when the Diamond Club programme closes outside of the UK and in Australia and New Zealand. As a non-UK based DC member with a future award booking – what is the refund policy if I want to cancel my existing booking after 31 December? As a non-UK based Diamond Club member, if you choose to cancel an existing award booking after 31 December 2012 you will receive a full refund of any cash paid when the booking was made. Unfortunately you will not receive a refund of any destinations miles paid due to the fact that your non-UK based Diamond Club account will be closed from 31 December onwards. As a UK-based Diamond Club member with a future award booking – what is the refund policy if I would like to cancel my future award booking? The normal refund policy will apply for any cancelled award bookings. You will receive a full refund of any miles and cash paid for the booking. Any refund of destinations miles will be made into your Diamond Club account. As a Diamond Club member which airlines can I continue to earn destinations miles with when I fly? You can continue to earn destinations miles when you fly with bmi, British Airways, Qatar, Jet Airways and Transaero. Please note that if you have a booking with any of these airlines where the date of travel is after 27 October, your booking will be honoured however you will not earn destinations miles. As a Diamond Club member which airlines can I continue to earn status miles with when I fly? You can continue to earn status miles when you fly with bmi or bmi Regional. Please note that you will no longer earn status or destinations miles when flying with bmi Regional after 30 September. You can continue to earn status miles when you fly with bmi until 27 October 2012. As a Diamond Club member which airlines can I no longer earn destinations miles with when I fly? You can no longer earn destinations miles when you fly with any Star Alliance airlines or with Virgin Atlantic. You will no longer be able to earn destinations miles when you fly with bmi Regional after 30 September 2012. As a Diamond Club member which airlines can I no longer earn status miles with when I fly? You can no longer earn status miles when you fly with any Star Alliance airlines. You will not earn any destinations or status miles when you fly with bmi Regional after 30 September 2012. As a Diamond Club member, can I continue to purchase destinations miles? Yes, you can continue to buy destinations miles online until 27 October 2012. As a UK-based Diamond Club member, which non-airline partners can I continue to collect destinations miles with? As a non-UK based Diamond Club member, which non-airline partners can I continue to collect destinations miles with? You can continue to earn destinations miles with bmi partner hotels and when you shop online. You will no longer be able to earn destinations miles after 27 October 2012. As a Diamond Club member which non-airline partners can I no longer collect destinations miles with? You can no longer earn destinations miles with bmi hotels, Europcar or Purple Parking. As a UK based Diamond Club member, how can I collect destinations miles after 27 October? As a non-UK based Diamond Club member, how can I collect destinations miles after 27 October? The Diamond Club is moving to a UK only programme, and as a non-UK based Diamond Club member you will be unable to earn destinations miles after 27 October 2012. Any destinations miles that remain in your account after this date should be transferred to Avios with the Executive club before 31 December 2012 when the non-UK programme closes. As a Diamond Club member with a future booking on British Airways, how can I earn Avios and tier points with the Executive Club on my booking? After 27 October you will no longer be able to earn destinations miles with the Diamond Club, therefore if your Diamond Club number is linked to a future British Airways flight booking you should update your booking with your Executive Club number in order to earn Avios and Tier Points through your Executive Club account instead. As a Diamond Club member, which airlines can I continue to redeem destinations miles with? You can continue to redeem destinations miles for flights with bmi, British Airways, Qatar, Jet Airways and Transaero. You will not be able to redeem destinations miles after 27 October, however you will be able to transfer your destinations miles into Avios with the British Airways Executive Club. As a Diamond Club member, which non-airline partners can I no longer redeem destinations miles with? You can no longer redeem destinations miles for bmi hotel and Europcar discount vouchers or for treats. As a Diamond Club member, how do I redeem destinations miles after 27 October? If you would like to redeem destinations miles after 27 October, you will have to transfer them 1:1 to Avios with the Executive Club. You can then redeem your Avios for flights with British Airways, oneworld airlines and British Airways partner airlines, hotels and car hire. As a Diamond Club member, how do I transfer my destinations miles to Avios? In order to transfer destinations miles to Avios you must become a member of the Executive Club. Please ensure that the details on your Diamond Club and Executive Club accounts match, including name, email address and date of birth – this will allow us to process your request. To request the transfer you must log into your Executive Club account, select ‘update my details’ from the left hand navigation menu and then select ‘Combine my Avios’ from the list of options on your screen. To complete the request, simply follow the instructions on your screen. As a UK based Diamond Club member when does my ability to transfer destinations miles to Avios end? You can continue to transfer destinations miles to Avios until further notice. Please note that you will only be able to collect destinations miles using an MBNA credit card from 27 October onwards. In order to redeem destinations miles collected through your bmi Credit Card account from MBNA after 27 October, you will have to transfer your destinations miles to Avios. As a non-UK based Diamond Club member you will be unable to check your mileage balance online after 27 October. You can call the Diamond Club to check your mileage balance or you can view your destinations miles balance through your Executive Club account when you use the transfer tool. As a non-UK based Diamond Club member, when does my ability to transfer destinations miles to Avios end? You can transfer destinations miles to Avios until 31 December 2012. Any destinations miles remaining in your account after this date will automatically expire when the non-UK programme closes. As a Diamond Club member, can I transfer my status miles to the Executive Club? No, status miles are non-transferable. If you hold Gold or Silver Diamond Club tier status British Airways will match your tier within the Executive Club. As a Gold/Silver Diamond Club member, how do I tier match within the Executive Club? If you would like to tier match within the Executive Club, you must visit ba.com and complete the online tier match request form. Your request to tier match may take up to 21 working days to be processed. Please note that you must join the Executive Club before you request to tier match if you are not a member already. As a Gold/Silver Diamond Club member, until when can I request to tier match within the Executive Club? You can request to tier match within the Executive Club until 31 December 2012. As a Gold/Silver Diamond Club member, how long will my tier match within the Executive Club last? When you tier match within the Executive Club you will be given your new tier status for the remainder of your existing Executive Club membership year, and the full membership year following.